Thanks to the players and to all the fans for supporting the team! Congratulations to Coach Evan Poulakidas for being voted AHAI's Coach of the Year! Good luck to our graduating seniors: Nate Berger, Nick Day, Noah Ginsburg, Nate Harris, Matt Holly, Mitchell Kasselman, John McNally, Parker Roth and Ryan Slovis. You will really be missed! The Glenbrook North Spartans will head Thursday to the United Center in hopes of winning a State Championship. The Spartans punched their ticket when they defeated Loyola Gold 3-1 in the semi-finals Sunday played at the Edge Ice Rink. The two rivals hooked up in the 8th meeting of the year, the last game was the Final of the SHL championship won by North 2-0. The Spartans used the same smothering defense as seen in similar games played between the two. The game was scoreless until Chris Zhang crossed the Loyola blue line cut to his left and let go a 35 snap shot that eluded Gold’s goalie Nick Bolino with 12 minutes left in the 2nd period. Gold’s Chris Nolan knotted the game at 1 when he found a loose puck just outside the Spartans crease and found a slight opening to the left side of Spartan goalie Nate Berger. The goal came with just over 15 minutes to play. On the very next shift the line of Logan Nein, Mitchell Kasselman and Matt Holly attacked the Loyola net. Nein got off a tight shot that was stopped by Bolino but Holly following up the play beat Bolino to his left giving the Spartans back the lead just 1 minute after Loyola had scored. The Spartans made play in the neutral very tough on the Ramblers as time after time out they were stopped at the GBN blue line. With 48 seconds to play Nick Day buried an open net goal from the left side boards and the celebration was on. The State final game will feature a rematch of last year’s game between the Spartans and New Trier Green Thursday night. Green defeated Providence 3-2 in the other semi-final. For the second year in a row, the Glenbrook North Spartans were crowned Scholastic Hockey Champions Sunday, when they defeated Loyola Gold 2-0 in game 3 of the best of 3 series, winning the series 2 games to 1. Loyola Gold forced a game 3 when they defeated the Spartans 2-1 in the second game played at Heartland Ice Arena. Game 3 was played before an overflow crowd and you could feel the tension from the drop of the puck. Loyola came out quickly in the 1st period pushing the play, but the Spartans were able to keep Gold on the outside of the ice. Many of the shots by Loyola were blocked before they ever reached the Spartan net. Midway through the 1st period, GBN forward Nate Harris had the puck under the Loyola goal line. He found Alex Merritt 10 feet outside Gold’s net, Merritt caught and released the puck in one motion and beat Gold’s goalie Nick Bolino for the first score. The 1-0 lead held through the remainder of the 1st and 2nd period. In the 3rd period, with just over 10 minutes to play, Harris was able to find a loose puck and score the 2nd goal of the night. Loyola put some heavy pressure on but the Spartan defense backed by goalie Nate Berger, turned back their attack time after time. The Spartans record stands at 59-13-1 for the year. Ryan Slovis and the rest of the Spartans advanced to the quarter finals of the State Championship with a thrilling 2 ot win against New Trier Blue by the score of 4-3. New Trier took a first period lead as Mac Moore poked home a rebound midway through the 1st period. The Spartans answered with 10 minutes to play in the 2nd period, as Chad Yale's slapshot beat New Trier's Nick Goss. 16 seconds later, New Trier took the lead again as a long shot by Nick Meyer escaped GBN goalie Nate Berger. Nate Harris tied the game with just over 6 minutes to play in the period as he found a Nick Day rebound and put it past Goss. Blue would take the lead into the 3rd period as another long shot beat Berger; this one off the stick of Brian Shiau, the goal coming with 3 minutes to play. Nick Day tied the game at the 10 minute mark as Nate Harris pressured a New Trier defenseman, stole the puck from behind the net and found Day open in the slot. The game remained scoreless until the 2nd overtime. With less than a minute gone, Chris Zhang pushed a puck past a pinching defenseman at the red line. Ryan Slovis flew up the slot, Zhang found Slovis who in one motion brought the puck from his skate to his backhand to his forehand and beat Goss over his left shoulder for the winner. The Spartans will take on Naperville Central in the next state game Tuesday night in Bensenville. The finals of the SHL opened Saturday as GBN (1) faced off against Loyola Gold(3). It did not take long for Gold to strike, just 25 seconds into the game. Gold's Cal Callahan picked up a rebound and beat Nate Berger to his left side.The Spartans answered when Nick Day found a loose puck in the high slot, walked in and fired it over Gold's Nick Bolino. Gold would then jump ahead on a goal by Ryan Hill. Hill came up the right side, cut to the middle and fired a low shot that beat Berger between his legs. With Gold up 2-1 in the 2nd period, Kyle Fisher battled hard in front of the Loyola net and his hard work paid off as he beat Bolino on the short side. The Spartans jumped ahead on a power play, as Alex Merritt found Nate Harris on the back door and Harris pumped it home. John McNally had much to do with the goal as Merritt's pass looked to be intercepted but McNally lifted the defenseman and the puck slid to Harris. Gold would tie the game 6 minutes into the 3rd period when Dan O'Grady found a loose puck and drilled a 35 foot shot past Berger. Mitchel Kasselman would get the game winner with just under 12 minutes remaining. Kasselman drove from the left side and beat Bolino with a low shot.The Spartans would hold off the Gold attack with good neutral zone play, giving up very few chances the rest of the night.Game 2 will be Saturday at Heartland Ice Rink; 2:30 puck drop. 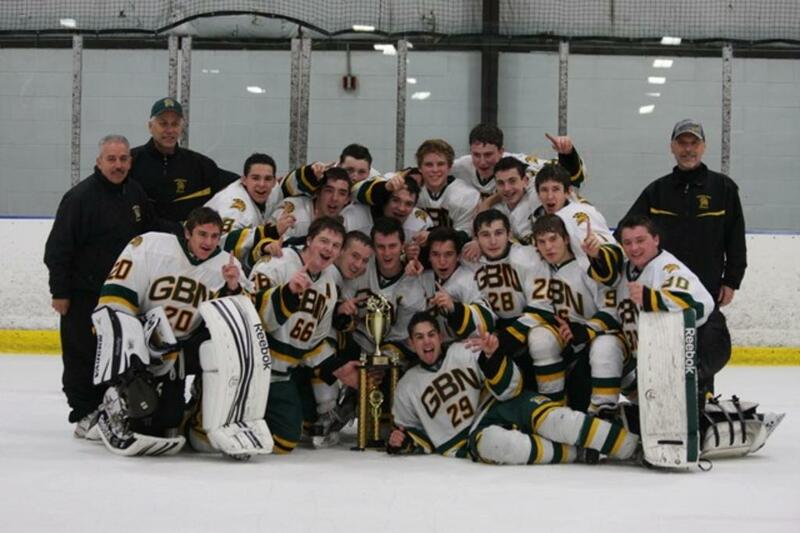 Glenbrook North advanced to the finals of the SHL when they defeated Stevenson 2-1 Sunday night in Buffalo Grove. 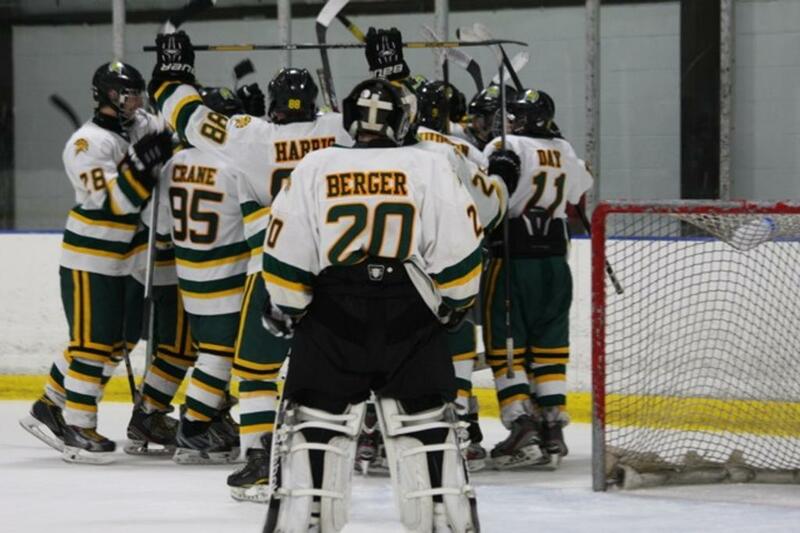 GBN goalie Nate Berger stood tall for the Spartans stopping 29 out of 30 shots. Berger's first stop might have been his biggest on the opening play of the game Stevenson forward Jake Cimarusti took the faceoff and walk around a Spartan defenseman and let go with a shot just seconds into the game that Berger stopped. GBN got on the board as the Slovis brothers combined for the 1st goal. Skating 4 on 4, Kyle Slovis took a pass from Chris Zhang who gained the Stevenson zone with Ryan Slovis and delivered a tape to tape pass to Ryan who skated left but shot back right from about 30 feet out that beat Stevenson goalie Corey Benjoya. The game remained 1-0 until late in the 3rd period when another odd man break developed for the Spartans, on a 2 on 1 Nick Day spotted Nate Harris and Harris finished the play for the 2nd Spartan goal. Seemingly in command, the game changed on one play. Stevenson defenseman Evan Baker knocked a clearing attempt at the Spartans blue line and let go with a slap shot that was tipped by Jake Cimarusti and past Nate Berger with 28 seconds to play. The pursuing faceoff found the puck entering the Spartan zone. A mad goal mouth scramble occurred with the puck lying on the GBN goal line. With a faceoff to the right of Berger, the Patriots had one more chance but a shot went wide. GBN will either face New Trier Green or Loyola Gold for the SHL finals, this marks the 3rd year in a row that GBN will play for a league title. 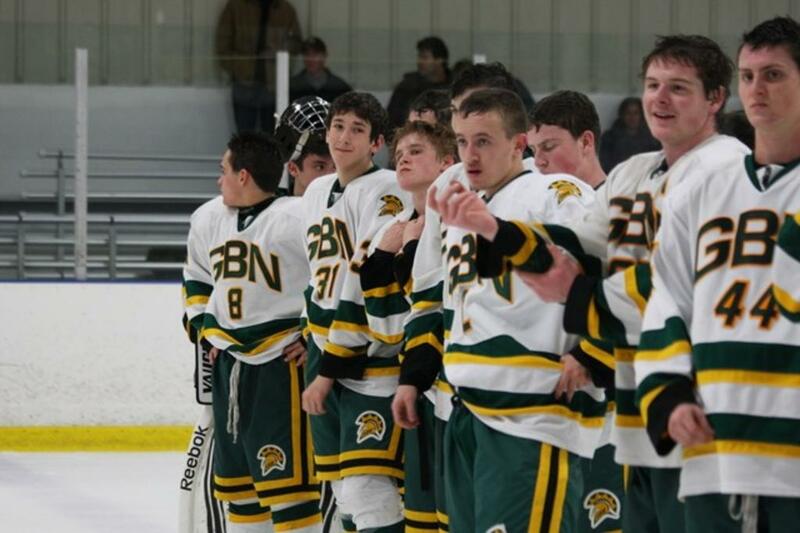 Glenbrook North opened the SHL semi-final series against Stevenson with a 3-2 win in Northbrook Wednesday night. The Spartans who had not a played a game in a week started slowly, only mustering 5 shots in the 1st period and trailed 1-0 heading into the 2nd period. GBN tied the game as on a 3 on 2 odd man break, Nate Harris was able to score. The tie was broken when Stevenson jumped ahead on a power play goal to end the scoring in the 2nd period. With the game winding down, the Spartans while on a power play tied the game on a goal by Mitchell Kasselman. Then with 1:05 to play, Nate Harris had the puck under the Stevenson goal line, Harris found Nick Day going to the net, Day caught the pass and fired a hard wrist shot which found the back of the Patriots net. The win gives the Spartans a 1-0 lead in the series with game 2 Sunday night at Twin Rinks in Buffalo Grove. Glenbrook North advanced to the Semi-Finals of the Scholastic Hockey League by defeating Barrington in game 2 of the best of 3 series by the score of 8-2. Alex Crane opened the scoring 6 minutes into the game with a long wrist shot that eluded Barrington net minder Marty Rytel. Alex Merritt of GBN followed up Crane's goal with a power play goal with just under 4 minutes to go in the 1st period. Barrington got on the board early in the 2nd period as Anthony Iacullo found a loose puck by the Spartan net and finished the play. 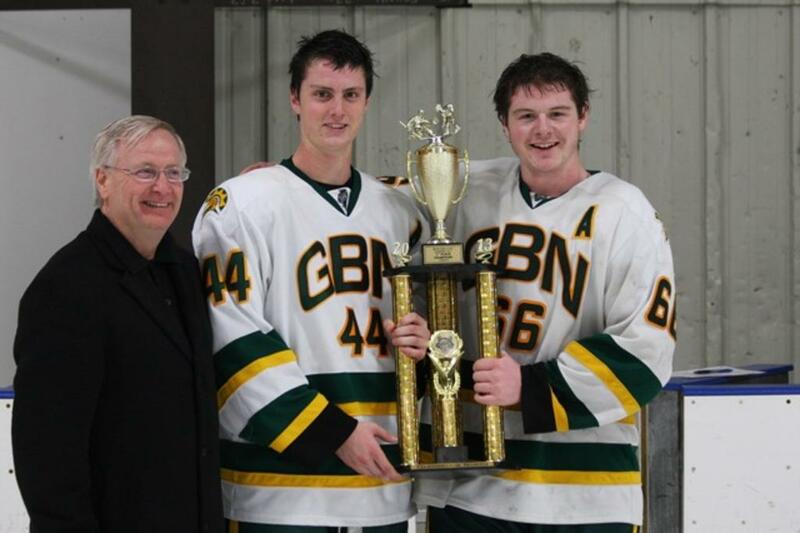 GBN center Joe Day ignited a 4 goal outburst with a breakaway goal with 13 minutes to play in the period. Chris Zhang, Logan Nein and Jake Rabin each contributed a goal. Barrington would score on the 1st shift in the 3rd period as Iacullo would score his second of the evening. Nate Harris and Kyle Slovis would add power play goals just a minute apart to put the game away. GBN would outshoot Barrington by a 40-18 margin. The Spartans will face either Stevenson or Rockford in the semi-finals. Time and dates to be determined. Glenbrook North took game 1 of the best of 3 quarter final SHL playoff series over Barrington by the score of 4-0.The Spartans' Nick Day set up the 1st goal. Day had the puck under the goal line at the right side of the Barrington net. He spotted Alex Merritt moving into some open ice about 5 feet out; Day landed the puck on Merritt's stick and Merritt let go with a one timer scoring the only goal of the 1st period. In the 2nd period, Ryan Slovis was responsible for setting up a goal as he drove the Barrington net while the Spartans were shorthanded, took a shot where GBN forward Matt Holly followed the play and tapped in the rebound for the only goal of period.The Spartans extended the lead in the 3rd period while on the power play as John McNally tipped in Alex Merritt's shot. Defenseman Chad Yale would finish the scoring as he went end to end with some flashy moves and backhanded a shot to the upper right hand corner. Nate Berger earned the shutout behind a strong defensive effort. Shots for the game were 37-17 in favor of GBN. Game 2 is Wednesday at Barrington. 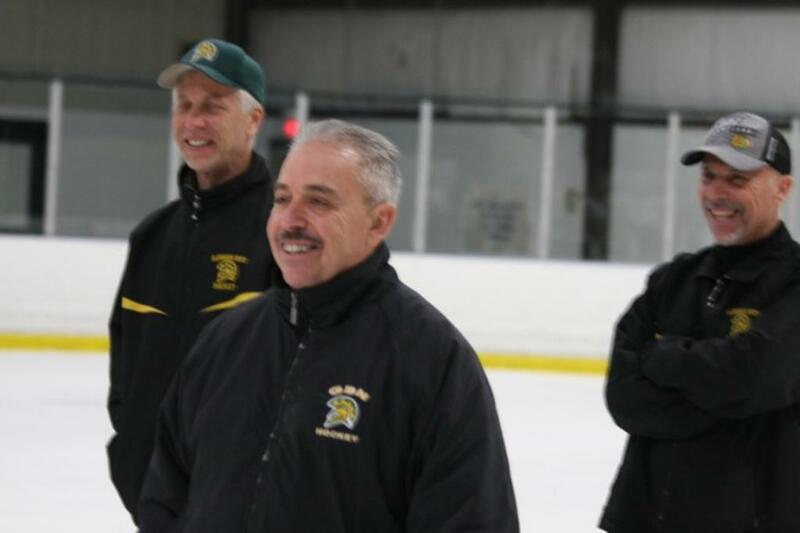 A big sigh of relief came out of the Northbrook Ice Rink Saturday night as the Glenbrook North Spartans were pushed to the brink against Saint Viator. The Spartans prevailed by the score of 3-2 in a shoot out. The win gave the Spartans the SHL Coaches Trophy, which represents the SHL regular season champion and the top seed heading into the league playoffs.Viator opened up the scoring with just under 2 minutes gone in the game as they capitalized on a 3-2. With just over 5 minutes to go in the 1st period, Spartan Alex Merritt tied the score with an assist from Nate Harris.The Lions would then take the lead as they scored just minutes into the 2nd period; the goal was scored short-handed. Alex Merritt would again tie the score while on the power play. John McNally came out from under the Lions net and found Merritt on the back door and Merritt made no mistake with the chance.There would be no scoring in the 3rd period. In the shoot out, the first three shooters from both teams missed. Sam Deihs of Saint Viator made a move to his right and beat Nate Berger to give the Lions the advantage. Nate Harris of GBN shot next and Harris fired a shot to the left side of Viator Goalie Joey Herrmann tying the shoot out. The 4th shooter for Saint Viator missed leaving the game in GBN's Parker Roth’s hands. Roth went in with speed and rifled a shot past Herrmann giving the game and the Coaches Trophy to the Spartans.Glenbrook North will either play Barrington or Prairie Ridge in the 1st round of the SHL playoffs. 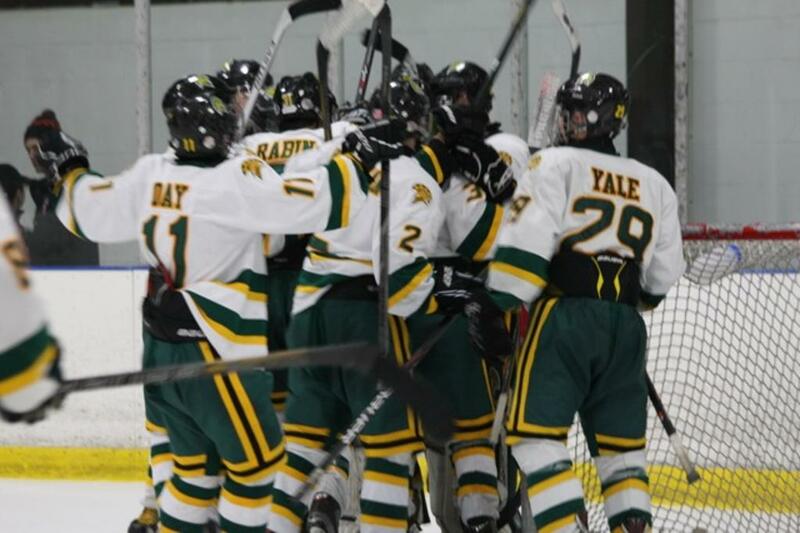 Glenbrook North defeated Prairie Ridge in a SHL clash by the score of 4-2. The Spartans peppered the Wolves with 44 shots but time and again they were turned back, John McNally got the Spartans on the board as he ripped a 45 foot slap shot in the 1st period. Jared Epstein found Chris Zhang streaking to the back left side of the Wolves net and Zhang buried his chance with just seconds remaining in the 1st period. Nick Day scored midway thru the 2nd period on a long shot giving the Spartans a 3-1 lead heading into the 3rd period. Chad Yale made a terrific rush up the ice and then delivered a pass to Zhang who netted his second goal of the game.The Wolves would add a late goal making the final 4-2. The Spartans had a showdown game for 1st place against the New Trier Green Trevians and in dramatic fashion North defeated Green by the score of 3-2. The tone of the game was set early as on the first shift of the game, Spartan Chris Zhang gave a heavy body check, stole the puck and went in on a semi break away that was thwarted by Green's goalie Jared Merens. GBN pushed hard in the 1st period and was rewarded when Nate Harris scored from in close as he took a pass from Alex Merritt. The goal came with just over 6 minutes to play in the period. John McNally put the Spartans up 2-0 as he battled hard in front of the Trevians net and pushed the puck through Merens for the goal. New Trier got themselves back in the game with a goal just 12 seconds into the 3rd period. Bradley Glass fired a wrist shot from the top of the left faceoff circle that Spartan goalie Nate Berger got his glove on but the shot trickled in. Things got real interesting with just less than 6 minutes remaining, Colin McBride picked up a loose puck at the red line and darted to the Spartan net creating a 3 on 2, McBride let go a shot that hit off a diving GBN forward Jared Epstein, the puck deflected off of Epstein and through the 5 hole of Berger to tie the game. Looking like overtime, the Trevians made one last attack into the Spartans zone. Spartan Alex Merritt won a puck on the left side board and chipped the puck out and behind the Trevians defenseman where Nick Day picked it up and rushed up ice. Nate Harris caught the play and came down the right side where Day delivered the puck to Harris on the tape and Harris did the rest scoring with just 17.7 left.The win vaulted the Spartans into the SHL lead by a point with 2 games to play. The Spartans celebrated Senior night with a solid 5-2 win over Barrington Saturday night in Northbrook. Nick Day's two goals and Nate Harris' 1 goal and 3 assists lead the Spartan offensive attack. Defenseman Chad Yale and Alex Merritt each contributed one goal apiece.The Spartans never trailed in the game leading 1-0 after the 1st period and 4-1 heading into the 3rd period. Nick Day's second of the night capped the Spartan scoring in the 3rd period. Senior Nate Berger was in net for the Spartans earning his league leading 12th win of the year. Seniors that were celebrated on this night were, Nick Day, Nate Harris, Nate Berger, Noah Ginsburg, Mitchell Kasselman, John McNally, Parker Roth Matt Holly and Ryan Slovis. In a tight checking defensive struggle Glenbrook North defeated Loyola Gold by the score of 2-0 Tuesday in Northbrook in SHL action.The Spartans got a power play goal from John McNally late in the 1st period. McNally picked up a puck that came off the end board and stationed perfectly in front of the net drove home the rebound. Nick Day would score in the 2nd period as a flurry of chances developed in front of the Ramblers net and Day took a whack at it and found the back of the net. The Spartans defense did an outstanding job of picking off passes in the neutral zone allowing a quick transition back into the Ramblers zone. It may also have been the Spartans forwards best night on the boards as they continuously were able to chip pucks out of their end allowing some odd man breaks going the other way. 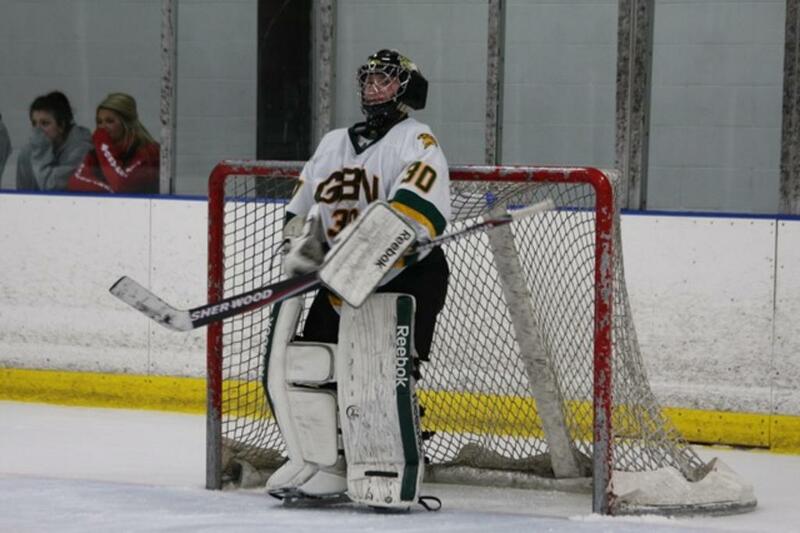 Nate Berger earned the shut out for GBN turning back all 15 shots that he faced. Powered by four 1st period goals the Spartans defeated the Prairie Ridge Wolves 6-3 in SHL action Saturday night. Slick passing by the line of Jared Epstein, Mitchell Kasselman and Chris Zhang led to the Spartans first tally as all 3 players touched the puck within 15 feet of the Wolves net with Zhang finishing the play with a tap in. Nick Day would fire home a slap shot from the point while on a GBN power play for the second goal. Zhang and Day would each add another goal to finish the period. Day's again was a power play goal. Defensive lapses in the 2nd period by GBN allowed the Wolves an number of good scoring chances of which they converted for 3 straight goals, 2 by Kyle Buresch and one by Carter Pierce to make the score GBN 4 PR 3 after 2 periods.The 3rd period saw the Spartans button down on their defense. Alex Merritt found the back of the Wolves net late in the period as he took a beautiful pass from Nick Day to give GBN a two goal lead. Zhang finished the scoring with an open net goal and his 3rd of the game. The Spartans opened up the New Year with mixed results, dropping a SHL game to Rockford Saturday night by the score of 3-0 but rebounding the following night with a 5-0 blanking of Saint Viator. In the Saturday game in Rockford, the Spartans never seemed to get on track surrendering two 1st period goals and a final goal in the 3rd period. Offensively, GBN was stymied time after time, failing to get pucks through to the net and losing many of the key puck battles as the night wore on. GBN would go 0-6 with a man advantage. In the Sunday game at Hoffman Estates against Saint Viator, the Spartans got going early with a goal just 35 seconds in as Nick Day received a pass from Alex Merritt at the left side of the Viator and beat Viator goalie Joe Herrmann. Merritt would then get a goal with just over 6 minutes to play in the 1st period with Day assisting. Chad Yale would close out the first stanza with nice rush and a goal late in the period. GBN would add to its lead with a single score in the 2nd and 3rd period. The Spartans would outshoot Saint Viator 37-11. The Spartans failed to defend their Blackhawk Holiday tournament championship as they were defeated in the quarter finals by Neuqua Valley by the score of 3-1. GBN had defeated Maine 7-2, Naperville Central 3-1 and Fenwick 4-1 to win their bracket heading into Saturdays game with Neuqua. An early goal by Neuqua had the Spartans chasing the game. Joe Day did tie the game with a sharp wrist shot with just under 9 minutes in the half. The tournament was played in two 22 minute halves. Valley took the lead for good towards the end of the 1st half when an errant Spartan pass was picked up at the red line as a Neuqua player stepped out of the penalty box and capitalized on the play with a backhand goal. GBN pushed hard in the 2nd half firing 20 shots to NV 6 shots but Valley was the only team to score in the half with a late goal. 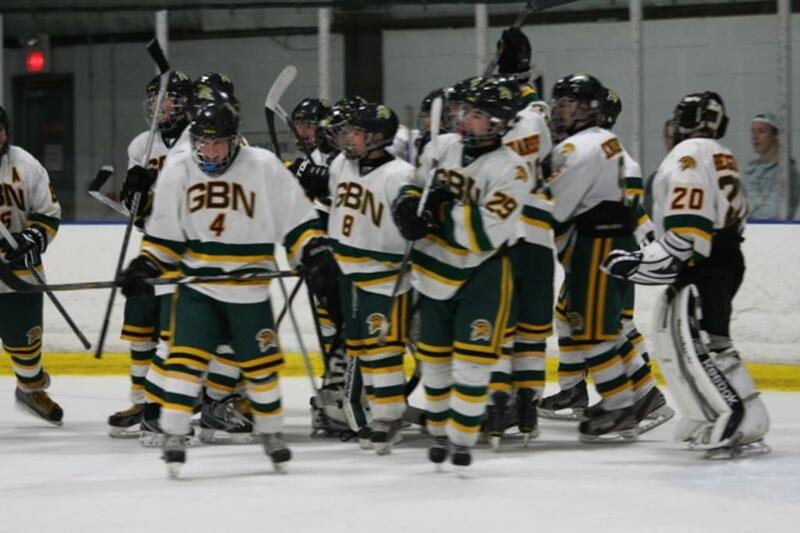 GBN would close out the SHL schedule for 2013 with a 8-1 win over Glenbrook South Saturday night in Northbrook. 4 power play goals and a five goal 3rd period did in the Titans. Kyle Slovis and Nick Day each scored 2 goals. Although Spartans did tally 8 goals, Titan goalie Matt Grinde was spectacular at times keeping the Spartans from scoring in the 1st period and keeping the game close heading into the 3rd period. GBN traveled to Buffalo Grove to take on Stevenson in a SHL contest.The Spartans would skate away with a 4-2 win. Noah Ginsburg put GBN on the board with the only goal of the 1st period. Ginsburg found a rebound and tucked it in for his first goal of the year. Stevenson would tie the game as Matt Heller scored a similar goal as Ginsburg finding a loose puck by the Spartans net and putting past goalie Nate Berger. GBN would answer with 2 goals to close the 2nd period. Mitchell Kasselman would score a power play goal and Ryan Slovis would add the final goal of the period. Stevenson would cut the lead to 3-2 to start the 3rd but Chris Zhang would add another power play goal to seal the win. In the 42nd annual Loyola Gold Thanksgiving tournament, the Spartans set out to defend their title. With wins over Saint Viator 4-1, Brother Rice 7-0, Highland Park 6-1 and semi final victory 6-1 over St. Rita, the stage was set for a defense against New Trier Green. The game was scoreless until defenseman Chad Yale's shot from the blue line found the back of the Trevians net. The goal was a power play goal. The Trevians not to be denied, would score 3 straight goals, 2 in the 2nd period and 1 in the 3rd period. With just over 10 minutes to play Matt Holly gave the Spartans life as he stole the puck behind the Green net, came out the left side and let go a 15 wrist shot that found it's mark. Down 3-2 and on a power play with 5 minutes to play, the Spartans had two in close in opportunities that shots just went wide. New Trier recovered a loose puck on the same power play in the Spartans zone and with goaltender Nate Berger out of the net put the 4th goal in sealing the game. In the "Rivalry Game" between the two sister schools, Glenbrook North and Glenbrook South, the Spartans would prevail by the score of 8-2. Defenseman Chad Yale got the Spartans going with a shorthanded goal early in the 1st period. Alex Merritt followed Yale's goal to close the scoring in the 1st period. The second period featured 3 more straight goals by the Spartans, Nate Harris, Chris Zhang and Mitchell Kasselman all added one goal each. South got on the boards with a power play goal late in the period, and opened the 3rd period with another tally making the score 5-2 in favor of North. But 3 more Spartans goals ended any hope of a Titan comeback. The Spartans defeated the Midget Major Skokie Flyers in a non SHL game by the score of 12-0. The scoring was spread around as 10 different goal scorers notched at least 1 goal. The Spartans would score 4 in the 1st period, 6 in the second and 2 in the 3rd period. Shots for the game were 42-10 in favor of the Spartans. Glenbrook North (27-7-1 overall) (SHL 8-2) defeated the Barrington Broncos in a SHL game Saturday night in Northbrook by the score of 5-1. Spartan forward Jared Epstein led the offensive charge with 3 goals. Epstein opened the scoring while on a power play as he took a pass down low from forward Chris Zhang, made one nice move from in close and put it into a wide open net with 5:12 minutes to play in the 1st period. Kyle Fisher would score the second goal as he received a pass from underneath the Broncos net from Alex Crane and let go with a quick wrist shot that beat Broncos goalie Margas Kunzman. Epstein would score his second of the night on the ensuing face off just 20 seconds apart from Fishers. Barrington would get on the board with just under 7 minutes remaining in the second period with a power play goal as Nick Coy would deflect a shot pass GBN goalie Garrett Cohen. In the 3rd period, John McNally would score the 4th goal for the Spartans as he took a pass on the Broncos goal line and walked out in front and beat Kunzman. Kyle Slovis would team up with Epstein for the 5th and final goal with another power play tally. Slovis at the right point faked a slap shot and passed it to a wide open Epstein at the left post and Epstein tapped it home. The Spartans defended their Prairie Ridge Wolves Cup by defeating Culver Academy by the score of 3-1 in the finals on Sunday. The game matched the same two teams that squared off last year with the same results. Culver took an early 1-0 lead early in the 2nd period. GBN center Joe Day would tie the game up when he recovered his own rebound and scored from in close. Matt Holly while shorthanded would give the Spartans the lead when his 25 foot wrist shot found the back of the Culver net. With 3 seconds to play in the 2nd period, Parker Roth on the power play, let go a drive from the blue line that also found it's mark. Goalie Garrett Cohen and the defense did the rest in the 3rd period making the 3-1 lead hold up. On their way to the championship the Spartans defeated Prairie Ridge 7-2, Barrington 4-1, DeMatha Catholic 5-1, Providence Catholic 2-1 in a shoot out. Kyle Slovis was the only shooter that was able to score in the Providence shoot out. For the weekend the Spartans only surrendered 6 goals in 5 games. Both goaltenders Nate Berger and Garrett Cohen were outstanding as was the overall team play. A solid defensive effort led the Spartans to a 3-0 win over Sandburg in a non SHL game Tuesday in Northbrook. Alex Merritt scored 28 seconds into the game, as Jared Epstein fed him a pass on the left side of the Sandburg net and Merritt dumped the puck into a wide open goal. Epstein and Merritt entered the zone on a 2 on 0 that originated off of a face off play. Late in the 2nd period, defenseman Jake Rabin found Mitchell Kasselman open in front of the net with a nice pass from the point. Kasselman knocked in his own rebound; scoring the second goal of the night. Kyle Slovis would end the scoring as he intercepted a pass just outside the Sandburg blue line and let go a 35 foot blast that beat Sandburg net minder Ryan Lewis with just less than 4 minutes to play. The Spartans back checking hindered many of the Sandburg rushes before they could enter the Spartans zone. 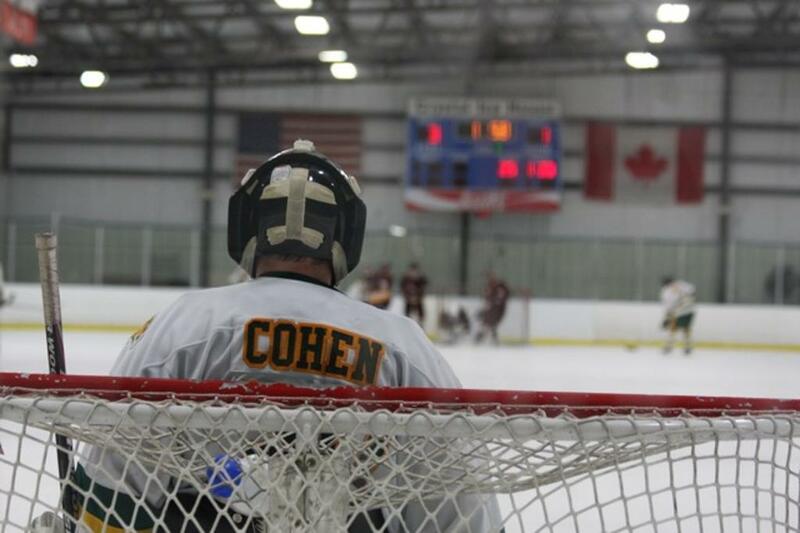 GBN goalie Garrett Cohen recorded the shutout stopping all 18 shots he faced. Nick Day with Four Goals! Nick Day's 4 goals and 1 assist paced the Spartans as they defeated Maine by the score of 7-4 in a non Scholastic Hockey League game Saturday night in Northbrook. Day scored a natural hat trick in the 1st period as the Spartans jumped out to a 3-0 lead. Maine would get right back in the game with 2 goals at the end of the period but Alex Merritt would score with just over 30 seconds remaining giving GBN another 2 goal lead. The two teams would trade 2 goals in each in the 2nd period making the score 6-4 heading into the 3rd period. Day would end the scoring with his 4th goal of the game as he took a pass from Merritt on the left side of the ice and buried his shot. It was a slow start for the Spartans as they traveled to Seven Bridges Ice Rink to take on defending Catholic League Champions Benet Academy. The game would end in a 1-1 tie. Benet had a decisive play in the 1st period but Spartan goalie Garrett Cohen was able to stop all 9 Benet shots. GBN was only able to muster 5 shots for the period. In the 2nd period, the Spartans started to increase the speed of play and had a number of good scoring chances but came away scoreless. In the 3rd period Benet got on the board first as Robert Ernsting picked up a puck just outside the Spartans blue line and muscled his way to the net and let go a back hand shot that beat Cohen just above his blocker. The goal coming with just over 9:30 minutes remaining. With less than three minutes to go in the game, the Spartans were awarded a power play. John McNally found Nate Harris on the left faceoff circle and Harris was able to find the far right corner of the net to tie the game. In the first meeting since the Blackhawk Cup State Championship of last year, New Trier Green faced Glenbrook North at North Shore Ice Arena on Sunday. The Trevians would hold on to win by the score of 2-1. The pace of the game was quick and close checking with plenty of chances for both teams in the 1st period. GBN would post 11 shots on goal but Green's John Junge was up to making all of the saves. The only goal of the 1st period was scored by Green's Mathias Solberg. Solberg stationed in the slot about 15 feet out would receive a pass from Matt Kenyon and Solberg shot sailed into the right corner of the net. The goal was scored while New Trier was on a 5-3 man advantage. The second goal of the game was scored in the 2nd period when Sam Berman would beat GBN goalie Nate Berger with a wrist shot. Down 2-0 GBN came out quick in the 3rd period and scored just 17 seconds into the frame. GBN's Alex Merritt would find a rebound off of Defenseman Chad Yale's stick and beat Junge with a back hand shot cutting the Green's lead in half. The Spartans would continue their assault on Junge outshooting Green 11-2 in the period but Green was good enough defensively to hold on to win 2-1. For the game, GBN registered 31 shots and NTG 18. The Spartans faced SHL foe Stevenson Saturday night in Northbrook and GBN came away with a 4-1 victory. GBN forward Nate Harris found a rebound off the shot of Matt Holly to open the scoring in the 1st period. Spartan defenseman John McNally would add a second goal when his long drive from the right point eluded Patriot goalie Corey Benjoya. The 3rd Spartan goal of the 1st period was scored by Nick Day. The three GBN goals came just 4 minutes apart. Early in the 2nd period Stevenson got on the board as Justin Pantle scored just seconds into a power play. Spartan Nate Harris closed out the scoring with a power play goal 2 minutes into the 3rd period. GBN outshot the Patriots 31-20. Backed by two goals by Ryan Slovis, the Spartans defeated Naperville Central in a non SHL game Wednesday at Seven Bridges Ice Rink. Slovis put GBN on the board in the 1st period when he chipped in a loose puck from in just outside the crease. Slovis scored his second goal early in the 2nd period as he snapped off a 20 foot wrist shot that hit the right side of the net. Nick Day found the upper left hand corner of Centrals net with a 25 foot wrist shot with just over 7 minutes to go in the period. Joe Day scored the 3rd goal of the period. Alex Merritt scored the nicest goal of the night as the Spartans moved the puck beautifully while on a 5-3 man advantage. Merritt stationed at the right side of the net took a feed from Chris Zhang and Merritt tapped the puck into a wide open net. Garrett Cohen in goal for the Spartans lost his bid for a shutout with just over 5 minutes to play. The Spartans will be at home Saturday night facing Stevenson and then will play New Trier Green Sunday at North Shore Ice Arena. The Spartans participated in the Central States Hockey League Showcase this past weekend and came away with a 3-1 record. On Friday night GBN faced the Chesterfield Falcons and defeated them by the score of 7-2. The games were played in 25 minute halves and the Spartans scored 5 goals in the first half on their way to the win. The second game on Friday featured Twin Bridges from Missouri. Again the Spartans started quick scoring 4 goals in the 1st half with their power play doing a lot of damage. The final: GBN 5 TB 0. Saturday's game featured Fenwick HS. The Spartans, behind 2 goals from Jared Epstein, defeated the Friars 6-1. The Afton Americans were the last opponent of the weekend and the best game of the 3 day showcase. The game was fast paced and physical. Neither team could score in the 1st half. Afton would take leads of 1-0 and 2-1. With just over a minute to play, with the Spartan net empty, Spartan Nick Day would crash the Afton net and find a loose puck and tie the game at 2. On the following sequence the Spartans had control of the puck in their zone, but a give away at the Spartan blue line allowed the Afton forward to walk in unchallenged, where a 20 foot snap shot would beat Spartan goalie Nate Berger giving Afton a 3-2 win. The Barrington Broncos jumped all over the Spartans in an SHL game Wednesday night in Barrington scoring two goals in the first 3 minutes. Tom Hannagan scored on a power play and Dominic Iacullo scored on a 20 foot wrist shot to stake the Broncos to a 2-0 lead heading into the 2nd period Logan Nein got GBN on the board at the 6 minute mark of the 2nd period when he found a loose rebound just outside the Bronco net and buried his shot. The turning point of the game occurred as the Spartans were killing a penalty. Spartan Chad Yale won a puck high in the Spartan zone and drove the right side of the ice. GBN Nick Day caught the play creating a 2 on 1. With great patience, Yale fed Day on the left side and Day finished the play. Just seconds later, Day took another pass from Yale at the red line and streaked in the right side and let go a 35 footer that hit the upper part of the net giving the Spartans a 3-2 advantage, a lead that they would not surrender. 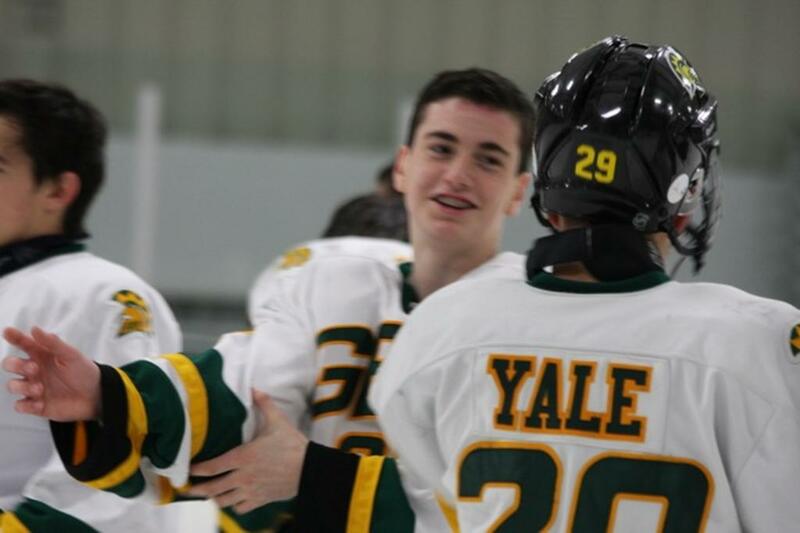 Chris Zhang and Chad Yale would each score in the 3rd period making the final Glenbrook North 5 Barrington 2. The Spartans traveled to Heartland Ice Rink to take on the Loyola Gold Ramblers in a highly anticipated Scholastic Hockey League game. The two teams did not disappoint as each team went toe to toe with the Spartans coming out with a 3-2 shoot out win. It was Rambler Griff Burns who opened the scoring in the 1st period as his 40 foot slap shot sailed over the left shoulder of Spartan goalie Nate Berger with 6 minutes to play in the period. The goal by Burns would stand up until Spartan Nick Day would put a puck past Rambler goalie Nick Bolino with 12 minutes to play in the 3rd period. GBN would take the lead as Kyle Slovis would scrape the puck off the boards from the right point and let go with a low wrist shot that Nate Harris was able to redirect giving GBN a 2-1 lead. With just over 2 minutes to play Gold pressured the Spartans where a turnover led to Rambler defenseman Cal Callahan knotting the game as he delivered a shot from the right side of the ice that beat Spartan goalie Nate Berger. The two teams headed to a 3 man shoot out. Ryan Slovis for GBN and Axel Lifvendahl both scored in the initial shoot out sending the game into a sudden death shoot out where Nikolas Kropp would score for Gold leaving it to Chad Yale to again tie the game which he did sending it to a 5th shooter. Berger would stop the Ramblers shooter while GBN's Parker Roth would come thru and score as he moved to his left and beat Bolino high for the winner. Glenbrook North welcomed the unbeaten and league leading Rockford Icemen to Northbrook Saturday night. Backed by Nick Day's second hat trick in back to back games, the Spartans came away with a 6-4 victory. Day's first goal came 3 minutes into the contest as he let go a wrist shot from just above the left faceoff circle. Three more Spartan goals opened the 2nd period giving GBN a 4 goal lead. Chris Zhang, Jared Epstein and John McNally (pp) each chipped in a goal. Rockford responded by cutting the lead in half late in the period with two power play goals of their own, Jonathan Pirrie and Zach Meyer credited with the scores. Each team traded two goals in the 3rd period. The Spartans extended the lead to 5-2 but Icemen Andrew Cropp cut it to 5-3. Day would score his 3rd goal pushing the lead to 6-3 only to have Anthony Healsip cut it to 6-4. Rockford could get no closer as the Spartans closed the game out. Backed by hat tricks from Nick Day and Nate Harris, the Spartans defeated Saint Viator 8-2 in a SHL contest Thursday night. The Spartans got off to a fast start firing 22 shots at the Lions but only coming away with 1 goal in the 1st period. In the 2nd period with the game tied at 2, Nate Harris would score a power play goal with assist going to Nick Day. Leading 4-2 entering the 3rd period, the Spartans continued their assault on the Lions net and came away with 4 goals to put the game away. GBN recorded 60 shots for the game which was their highest total so far this season. Saturday and Sunday will prove to be tough test as the Spartans face unbeaten Rockford Saturday in Northbrook and then Loyola Gold on Sunday at Heartland Ice Arena. GBN wasted little time in their effort against St. Rita as Ryan Slovis scored with just 59 seconds into the 1st period. Slovis with his linemates Alex Merrit and Chris Zhang dogged the puck until Slovis let go with a 15 footer that found it's mark. The goal was the only tally in the 1st period. Alex Merritt led the Spartans in the 2nd period with two beautiful power play goals. Chris Zhang finished the scoring in 3rd period. Garret Cohen was in goal and turned back all 20 shots he faced. The final was GBN 4 St. Rita 0. The Spartans traveled to Twin Rinks in Buffalo Grove to face Stevenson Saturday night. The 1st period was scoreless with both teams having terrific chances. Five minutes into the 2nd period Spartan forward Alex Merritt scored on a power play when his shot hit the upper right hand corner. Stevenson would come back with a short handed goal and a power play goals just minutes apart. GBN would tie the game when Nate Harris would drive the Patriot net and make beautiful back hand pass to Center NIck Day who would make no mistake with his shot. Early in the 3rd period Stevenson would take the lead. Logan Nein would then tie the game as he followed up a terrific individual rush by Kyle Slovis. Slovis' shot was turned back but Nein found the rebound and finished the play. A three man shoot out followed, each team scoring 1 goal, Day accounted for the Spartans tally. Chad Yale shooting 4th for the Spartans drilled a shot that went off the left post and into the net, while Nate Berger made the final save on Stevenson's final shooter making the final 4-3 GBN. Three 1st period goals paced the Spartans to a 5-0 win over Catholic League power St. Rita Thursday night at Southwest Ice Arena. 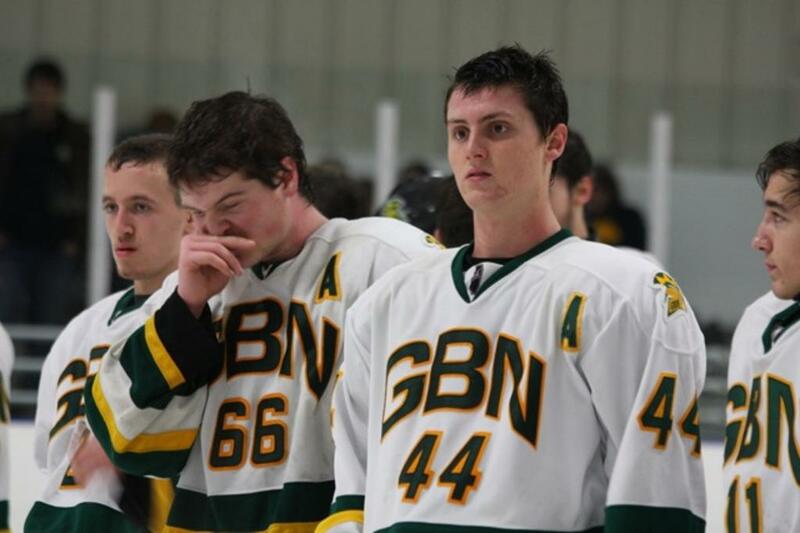 Alex Merritt led the GBN with 2 goals while John McNally, Ryan Slovis and Chris Zhang each had one. The Spartans have a busy weekend, first playing Stevenson at Twin Rinks this coming Saturday and then playing a rematch game against Rita this coming Sunday in Northbrook. Four power play goals paced the Spartans to an 8-2 win over Fenwick in a non-Scholastic League game Sunday night. Alex Merritt accounted for 2 of the 4 power play goals, John McNally and Nick Day had the other 2. The Spartans leading 4-1 entering the 3rd period dented the Friars net 4 times in the period putting the game away. Glenbrook North opened up the Scholastic League season against Loyola Gold Wednesday night in Northbrook. The Ramblers skated to a 4-2 win. The game was scoreless in the 1st period. Six minutes into the 2nd period, Rambler Nikolas Kropp using a GBN defender to screen goalie Garrett Cohen, let loose a 30 foot wrist shot that beat Cohen. Loyola followed up that goal with a power play goal to close the scoring in the period. Loyola would gain a 3 goal lead when Cal Callahan's shot would deflect off of a GBN defenders stick and past Cohen. GBN forward Chris Zhang would find Alex Merritt on the back door and Merritt buried the shot for a power play goal making the score 3-1 with close to 11 minutes remaining. Jared Epstein narrowed Gold's lead to 1 when he found a loose puck inside the crease and shoved it past Rambler goalie Nick Bolino. The Spartans could not get any closer and with 16 seconds left, Gold's forward Axel Lifvendahl would score an open net goal making the final LAG 4 and GBN 2. Two late 2nd period power play goals by Providence Catholic propelled the Celtics to their second straight win over the Spartans Sunday afternoon at Southwest Ice Arena. Jared Epstein staked GBN to a lead with 6 minutes to go in the 1st period. Providence would answer that goal with just over a minute to play when they converted on a 2-1 chance. Nick Day would again give the Spartans a 1 goal lead with a goal midway through the 2nd period. The Celtics answered with 3 straight goals of their own in a four minute span late in the period two of which were power play tallies. Alex Merritt would cut the Providence lead to 1 with over half the 3rd period to play but the Spartans were never able to get the equalizer and would fall by the score of 4-3. Providence Catholic came to Northbrook Wednesday to face the Spartans. It would be the Celtics that would leave with a 2-1 win. The first two periods were scoreless, in large part to junior Spartan goalie Garret Cohen's performance. Cohen was brilliant stopping both point blank chances and a number of breakaway chances by the Celtics. GBN's Joe Day opened the scoring midway through the 3rd period. His goal came off of some cycle work down in the left corner by defenseman Jake Rabin and linemate Kyle Fisher. The Celtics would tie the game on a power play minutes later. With just 10 seconds to play Providence again on a power play would throw the puck towards the Spartans net where it kicked off of one GBN's defenders skate and just past Cohen for the winner. The two teams will see each other again Sunday down at Southwest Ice Arena. Behind 4 power play goals and 1 short handed goal, the Spartans defeated York by the score of 7-0. Alex Merritt led the offensive charge with 3 goals. The Spartans outshot York by a 40 to 16 margin. The Spartans posted a solid win against Benet on Wednesday night with a 3-0 victory. The first period was scoreless but early in the second period John McNally got the Spartans on the board with a nice deflection off a shot from defenseman Matt Rosen. Nick Day would provide the rest of the scoring as he would score twice in the 2nd period. The 3rd period was scoreless. The Spartans travel to York Friday night for another non-league contest. The Varsity played in the Prairie Ridge pre-season showcase in Crystal Lake on Sunday where they split their two games. In the 1st game against Loyola Gold, the Spartans defeated Gold by the score of 2-1. Ryan Slovis took a pass from Chris Zhang and buried a shot from 8 feet out late in the 3rd period breaking a 1-1 tie. The Spartans behind junior goalie Garrett Cohen would hold off the last push from the Ramblers. The Spartans dropped the 2nd game against New Trier Green by the score of 6-3. The Spartans had a great start but could not crack through for a goal. The Trevians took advantage of some of their early opportunities and built a 2-0 lead. GBN closed the gap to 2-1 and 3-2 but could never get the game back to even. The Spartans looked like they had some momentum when they scored their 3rd goal making the score 5-3 with close to six minutes remaining but the New Trier salted the game away on a 4 on 4 situation with 3 minutes left as they scored on a 2-0 at which goalie Garrett Cohen had no chance at stopping it. The Spartans will continue their preparations for the upcoming season with a non-conference game against the defending Catholic Champions Benet on Wednesday night. It also marks a rematch of last year's State quarter final game between the two schools.